Binance Labs Releases 8 Blockchain Projects From Its Incubator Program. Binance Labs, the branch of the famous Exchange Binance focused on promoting initiatives related to the use of blockchain technologies, has recently announced the release of the first batch of projects that became a reality thanks to its incubation program. According to a Press Release shared with Cointelegraph, the Binance Labs team promoted a group of 8 projects destined to solve essential challenges faced today by industries that are oriented to the use of crypto or that rely on Distributed Ledger Technologies to offer their services. 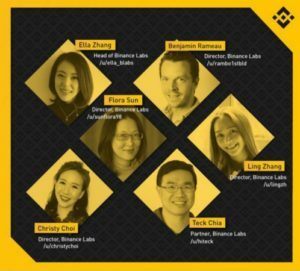 Speaking to Forbes, Ella Zhang expressed that with this program, Binance not only focuses on the use of current technologies but also is working to build a better future by investing in projects that do not have the necessary resources to begin but have great potential to help the ecosystem in the future. Over 500 projects applied for the first round of the Incubation program, however only 8 got approval from the Binance Labs team. These projects received direct funding of $500,000 and access to a series of human and technological resources that will allow their rapid and successful development.